I’m excited to announce that I was asked to contribute to Retail Touchpoints’ 2013 Outlook Guide on behalf of BIGinsight™ and below is our article. To view the full Guide, which includes contributions from 13 retail industry experts — including well-known analysts, consultants and researchers, and one retailer – please click here. The economic crisis that rocked our country nearly five years ago has clearly left its mark on today’s consumers. Gone are the days of excess when shoppers would spend now and worry later about paying for their purchases. The “new normal” mindset mandates that consumers think twice about their purchases, spend when necessary, and scrimp and save at every corner. While the fiscal responsibility we’re seeing now is necessary for the long-term health of our still-fragile economy, retailing as we know it has become an increasingly competitive landscape with merchants vying for a share of this shrinking wallet. The challenge for retailers now is to attract customers, get them into their stores (or online), and keep them there through the checkout. In this new economy, it’s imperative that retailers create marketing communications plans that integrate both new media and more traditional outlets in a manner that speaks to their core customers effectively and efficiently. With this in mind, BIGinsight identified three media trends influencing consumer purchases within the very competitive apparel category. 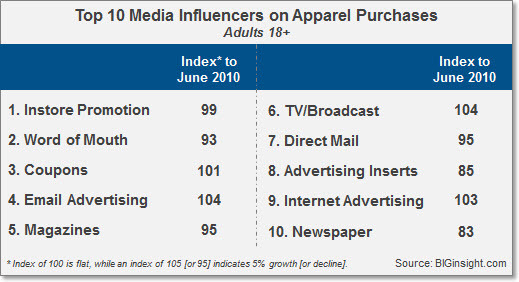 While consumers indicate that the top ten types of media that influence their apparel purchases are of the more traditional variety, half of these media have declined in influence over a two year period, while others are showing slow or no growth. With circulation rates slipping, it may come as no surprise that the effectiveness of newspapers (Index* to June 2010 = 83) and advertising inserts (Index = 85) are facing the steepest declines. Other forms of print media are suffering as well; the influence of magazines and direct mail has diminished 5% for each over a 24 month time period. Today’s budget-minded consumers appear to be keeping the influence of instore promotions and coupons afloat, while TV, email, and internet advertising have remained relatively stable as well. While the various forms of mobile and social media don’t appear within the top ten media influencers for apparel, their pull among clothing shoppers has become much stronger over the past two years. 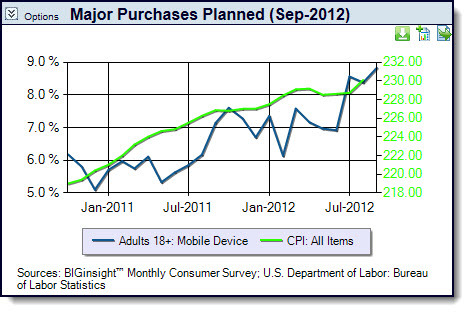 In fact, the influence of mobile devices on apparel purchases has increased 130% over June 2010! Social media (Facebook, Twitter, etc.) has increased nearly 40%, while blogs (Index* to June 2010 = 140), videos on mobile devices (Index = 143), and text messaging on mobile devices (Index = 133) have realized double-digit growth as well. The Millennial generation (born between 1983 and 1993) is quite literally the driving force behind the growth of influence of mobile and social media on apparel purchases. Compared to the average consumer (Adults 18+), Millennials are more than twice as likely to indicate that videos on mobile devices (Index* to Adults 18+ = 247) influence their clothing expenditures. Blogs (Index = 238) and text messages on mobile devices (Index = 213) are highly influential with this younger group of consumers, as are social media (Index = 188) and mobile devices in general (Index = 195). While the economic downturn certainly shoulders much of the responsibility for the new consumer, we also must consider the impact of new technology as a changing force behind evolving shopper behavior. While still relatively small, the growing influence of mobile and social media on purchases cannot be ignored by retailers. Today’s smart shoppers are tapping into a wide variety of media for product information, reviews, availability, sales/promotions, and pricing. Knowing your customers and the types of media to which they adhere are key to developing a successful marketing strategy in the increasingly competitive retail environment. To view the full 2013 Outlook Guide from Retail Touchpoints, click here. * Index of 100 is flat, while an index of 105 [or 95] indicates that a figure is 5% higher [or lower] than the comparative figure. Can an iPhone 5 Save JC Penney? It seems that Apple has the Midas Touch, and when JC Penney brought former SVP Ron Johnson on board in late 2011, it was heralded by many as a genius decision. Long relegated to the back of consumers’ minds [along with Sears], it appeared that this department store dinosaur was finally making a conscious effort to reinvigorate its stodgy image and arming itself to compete with its more present day foes: Macy’s, Kohl’s, and TJ Maxx. With the advent of m-commerce, social media, and increasing connectivity, it seemed that this marriage between an Apple exec and JC Penney was a solid union – at least enough to advance the department store into 21st century retailing. However, as 2012 has progressed, it has become clear that the new “Fair & Square” JC Penney has gotten off to a very rocky start. While JC Penney certainly has taken some steps in the right direction – focusing on exclusive brand names from the likes of Nicole Miller, Liz Claiborne, Mango, and even the Olsen twins takes a page from Kohl’s and Macy’s successful playbooks. Today’s consumers demand quality products at great prices, and they want to feel good about their purchases when walking out of the store. Here’s where JC Penney missteps: they have eliminated the excitement from the shoppers’ buying process. Having an extra 10-20% off coupon or buying an item on sale – which Kohl’s and Macy’s offer in abundance – gives the shopper the feeling that they’ve one-upped the retailer, i.e. the customer wins. This shopping euphoria is essential when marketing apparel in an uncertain economy. Consumers already had closets full of clothes, and when it came time to really trim budgets during the “Great Recession,” apparel was one of the easiest budget cuts to stomach. It’s interesting that even during a downturn in the economy, electronics sold – maybe with a little less frequency and at somewhat lower price points, but the latest HDTVs, tablets, notebooks, smartphones, and all things iOS were, and continue to be, hot selling items. Budget-conscious consumers could justify the purchase of a new TV or computer; these were items that the whole family could enjoy, helped us multitask, and in some cases, assist with homework. In other words, electronics were fun, practical, and educational. Consumers literally couldn’t buy into this same reasoning when it came to apparel or home goods, categories that JC Penney so desperately needed to move on the selling floor. When Johnson joined JC Penney last year, it appeared that the Apple “ego” followed him as well. Apple is an innovative brand with a heady following, and its retail outlets, which Johnson cultivated, served to build on this loyalty and brought out the curiosity in others – they were what shoppers demanded and gravitated toward. JC Penney lacks the Apple cachet, and its “Fair & Square” overhaul – ditching coupons and weekly promotions in the process – failed to make a compelling argument as to why shoppers needed to check out their revamped stores. Sure low prices are great, but the new normal directs shoppers to seek out that extra incentive when it comes to buying non-essentials like apparel and home décor. The “new” JC Penney already has proof of this – just look at its successful free haircut promotion for Back-to-School; the operative word here, of course, is free. A glance at what motivates shoppers to make apparel purchases shows us the continued importance of instore promotions and coupons in this category. 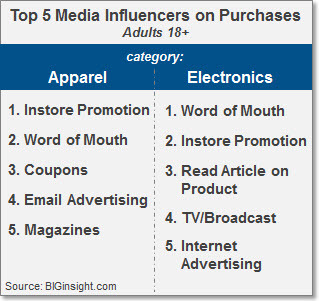 According to BIGinsight’s semi-annual Media Behaviors and Influence™ survey of 25,000 consumers, apparel sales and promotions are the #1 driver for shoppers of many of the top U.S. retailers, including JC Penney, Kohl’s, Macy’s, Gap, H&M, and Nordstrom – yes, even promotions are key with luxury shoppers. 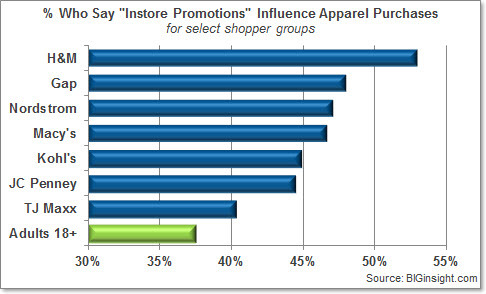 And, in instances where instore promotions aren’t the top motivation for apparel purchases, they are still likely top of mind. At TJ Maxx, for example, while 42.3% rely on word of mouth, nearly as many (40.4%) value a good sale. While word of mouth is the #2 influencer for apparel purchases among JC Penney shoppers (at 36.3%), coupons are almost as important (35.5%). JC Penney customers’ attraction to apparel coupons is stronger than that of the general population (30.7%) as well. Coupons don’t carry nearly as much clout over in Apple’s wheelhouse – electronics – so it’s plain to see why Johnson was so quick to axe those money-savers at JC Penney. So can an iPhone save JC Penney? Can a marketing approach borne from Apple revive a struggling department store? Can pigs fly? Clearly not. What works for Apple – what used to work for Ron Johnson – simply has no place in JC Penney’s strategy. Today’s apparel shoppers have honed their bargain-hunting skills and crave a good deal on their terms. Instead of trying to force “Fair & Square” on the buying public – much like the launch of a great, new, innovative product à la Apple – JC Penney really should have first become more attuned its target customers. This post originally appeared on Forbes.com as a contribution to the Prosper Now blog. More and more consumers are acquiring the means to be mobile. Naturally, those who have smartphones and tablets are using them for a variety of purposes. Some may even be considering replacing their laptop! 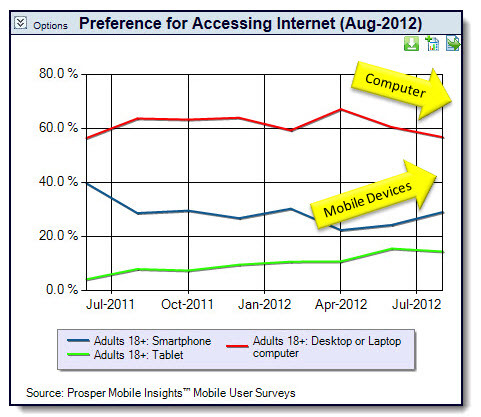 Although a desktop or laptop computer is the preferred method for Internet access, this portion has been declining since April 2012. Earlier this year, 2 in 3 (67.1%) preferred using a computer to access the Internet, compared to just over half (56.7%) as of August. Mobile Users who prefer using a smartphone for web surfing have increased in numbers from April (22.3% to 29.0%) along with those who opt for tablet devices (10.7% to 14.3%). Would you like to discover your own mobile insights? All of these and more can be found at the Prosper Mobile InsightCenter™. Check it out soon! For the entire month of October, Prosper Mobile Insights is offering an All Access Pass to behind-the-scenes segments including wireless providers, retailer shoppers and extended demographic segments. Researching products on a smartphone or tablet is quite popular among Mobile Users – 39.6% say they regularly conduct mobile research while 48.5% occasionally do so. 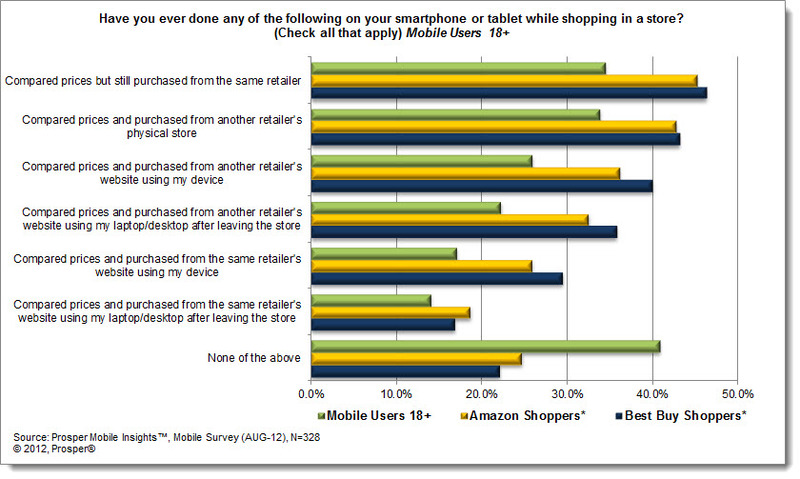 Two in three (66.5%) also regularly or occasionally purchase products using their mobile devices. It’s no big surprise that mobile cross-shopping (searching the web on a mobile device to compare offerings and prices while browsing a physical store) is a growing trend among shoppers equipped with smartphones and tablets. *For this analysis, Shoppers are defined as those who said they shopped at a particular retailer in the past 90 days. It’s interesting to see the vast majority of those who’ve recently visited Best Buy have cross-shopped without leaving a store, further promoting Best Buy’s growing reputation as Amazon.com’s showroom. These savvy mobile users are looking for the best buy, whether it’s at their current shopping location, next door or online. Over a third (36.8%) of Best Buy shoppers say they’ve requested a price match via mobile while shopping…perhaps they’ve informed a Geek of a better buy found through the Price Check app from Amazon? Best Buy could be in trouble if Amazon’s customers continue to find the site so favorable. As some of you may know, we’ve been releasing these really handy tools called InsightCenters, perfect for serving up answers in an intuitive, interactive and illustrative way. You can find insights on a wide range of topics – mobile device ownership, Hispanic consumers, new vehicle purchasers, government unemployment stats, and even the economy of China—all at the click of a mouse or the tap of a touch screen! At the moment I have a domestic focus, and have been exploring our American Pulse InsightCenter, which takes a look at how Americans feel about the upcoming election, the economy, technology, and much more! Members of Generation Y are more likely than older generations to say they are addicted to the Internet and Facebook. 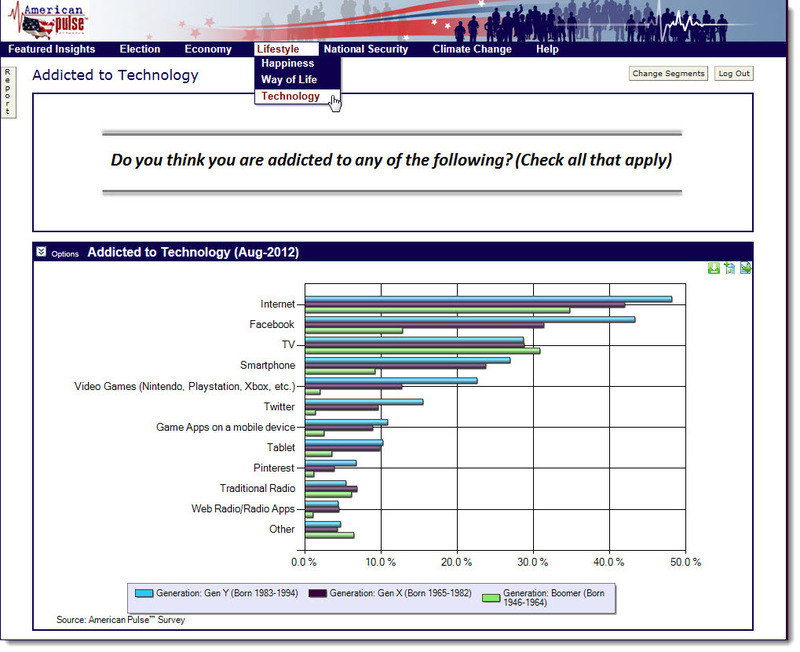 More Boomers than younger Americans say they are addicted to TV. Men are more likely than women to be happier with the work life, and both genders’ happiness levels in the workplace are higher in 2012 than they were in 2011. Women, however, are more likely than men to be happy or totally happy with their love lives. In July, Hispanics were more likely than Whites and Blacks to thoroughly enjoy their lives rather than worrying about making money. Members of Generation Y are more confident that the government’s economic policies will help lower unemployment, and their confidence is growing. Neither Presidential candidate has a positive Net Promoter Score* among Likely Voters. Obama, however, receives a higher score among Democrats than Romney does among Republicans. *About the Net Promoter Score (NPS): Respondents were asked to rate, on a scale from 0 (Not at all likely) to 10 (Extremely likely), the probability they would recommend each presidential candidate to a friend or colleague. 10 and 9 responses indicate Promoters, 8 and 7 responses are Passives and 0 through 6 are Detractors. NPS is calculated by subtracting the percentage of Detractors from the percentage of Promoters. Does your data run low? Do you guard it on the go? Do you track it with an app or budget like a pro? 1 in 10 Verizon customers also download an app to watch how close they come to their data limit. 8.7% of AT&T customers say they have switched providers to increase their available data. At the moment, the majority of Mobile Users (66.9%) say they have unlimited data plans. 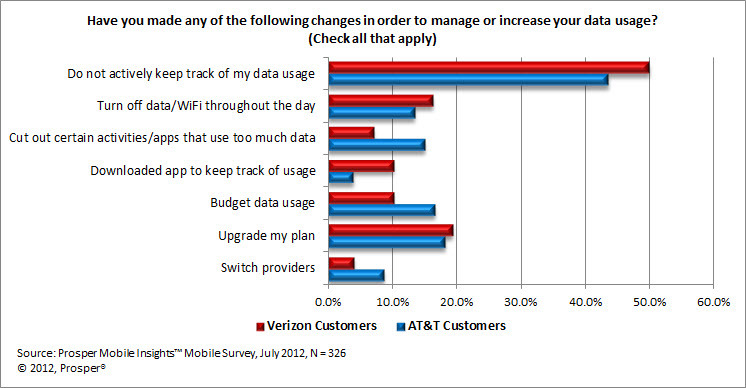 More Mobile Users on Team Verizon (72.4%) have these unrestricted plans while 52.4% of AT&T customers say the same. 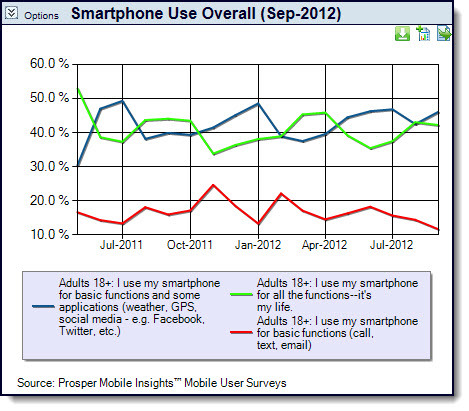 Concern over data usage certainly isn’t stopping mobile users from browsing the web on their smartphones or tablets. Most prefer to use their device to access Google and Facebook while others say they ONLY use their device to access email or conduct a browser search—no need for a laptop or desktop for these mobile-savvy consumers!